Don’t Miss the Biggest Deal in Live Polymer Clay Classes That You’ll See All Year! At this MEMBERS ONLY EVENT you can pick from 10 classes. Take up to 3 of them. Enjoy a potluck lunch. And spend a whole day sharing and learning with other polymer addicts for one insanely low price. There’s classes for all skill levels, from total beginners to clay experts. WHERE? Our regular meeting location at Northminster Church. HOW IT WORKS: The day is divided into 3 class sessions. All Classes are an hour and thirty minutes. Classes are $20.00 each. Buy 1 GET 1 FREE or take two classes for $20. Buy 2 still GET 1 FREE. 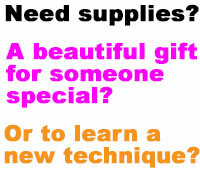 You can take 3 classes for the extra special price of $40.00 total. This is possible because of the generosity of members just like you and their donations to the Memorial Fund which is used for polymer clay education. We’re offering 10 classes for all skill levels. There’s everything from beginning sculpting to expert caning, finding & finishing tricks. 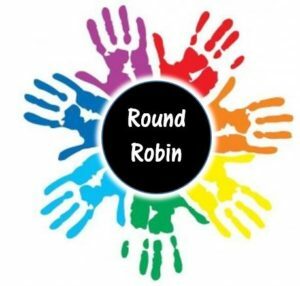 Round Robin 2018 Class Description Brochure. 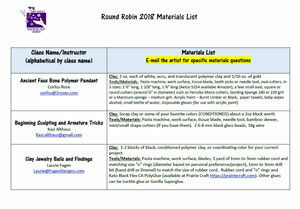 Then click to read and download the Class Materials List. 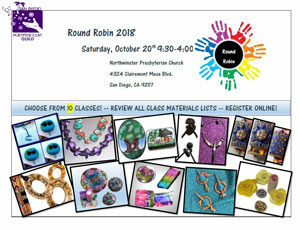 First, you HAVE to be a member of the San Diego Polymer Clay Guild to take avantage of this opportunity. Next, check your email for your personal invitation with your secret password. The subject of the email is, “SDPCG – You’re Invited to Round Robin 2018“. The email will contain your secret password and a link to the Round Robin Registration form and payment . PRE-REGISTRATION CLOSES OCTOBER 10th. Last minute (after 10/10) sign-ups will be allowed if space and instructor approves. Some instructors need to prep and can’t take last minute signups.